The simple tapered twin-hoop design of the Arch 2 tunnel tent is an ever-popular choice with cyclists, trekkers and other lightweight campers and this tent offers all the features and comfort required for less demanding adventures. The Arch 2 pitches quickly and easily, making it the ideal shelter for self-propelled travellers who, at the end of an exhausting day, want to relax in generous internal space with a handy porch for storage. The new Robens Route range meets the growing demand for entry-level technical tents that are easy to understand and use. These perfectly address the needs of adventure sections of national award schemes, youth organisations and for those adventures just starting out who are looking to balance performance with a competitive price tag. 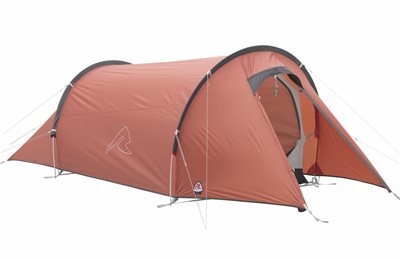 The four tents use our stunning new Magma Orange embossed HydroTex Core polyester with aluminium alloy poles. The range has been developed around time proven designs for reliability and comprises: Pioneer 3EX three-person tunnel, Arch 2 a twin-hoop ten for two, Boulder 2 dome tent that sleep two; and the arrow head single hoop tent for solo use.